Quieter Seaton- like Sidmouth on the Jurassic coast in East Devon. At the mouth of the River Axe, sheltered from the worst of winter storms by Beer Head. See the boats bobbing in the harbour. 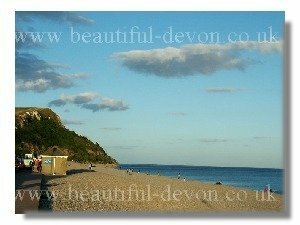 Over a mile long pebble beach backed like Sidmouth by an Esplanade - popular with families. Take the West walk to avoid the holiday crowds.